Beauty pageants and contests have always been of enormous importance in Jamaica, a vexed and competitive arena that was biased in favour of light-skinned or white girls who defined the ideal of beauty in Black Jamaica. With her green eyes and fair skin Cindy was the embodiment of the “hallowed sororities” of light/white beauty queens produced by the Anglophone Caribbean and thus the ideal candidate to represent Jamaica at Miss World. Unfortunately for her the Manley government in an acknowledgment of the black power movement sweeping through the Caribbean had banned beauty pageants and the Miss Jamaica contest in particular as politically incorrect. 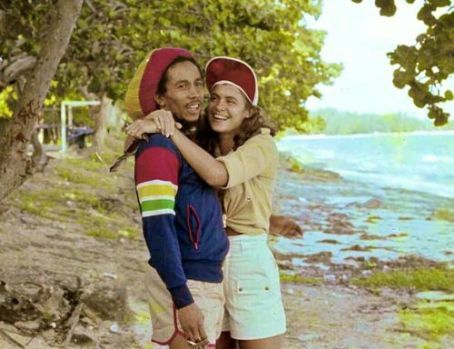 Nevertheless she was glad at the end of the year to be able to resume her blossoming relationship with Bob Marley which had continued during her reign; in fact the London press had made a mini-scandal of their affair billing it as a romance between Beauty and the Beast. It may be hard to imagine today but in those days it was not difficult to demonize Marley with his locks and Rasta livity. In fact Marley was similarly typecast by the middle and upper classes in Jamaica to whom Rastafari was anathema. Nevertheless Cindy was committed to her relationship with Bob. Now that she had experienced the dizzying heights of being judged the most beautiful woman in the world she was keen to settle down and create a life for herself. Realizing during her coronation year that she was pregnant with Bob’s child Breakspeare decided that it was time to start the family she herself had never had. Marley and she had a surprising amount in common, “We definitely were both passionate about the idea of being healthy and keeping fit”. Cindy’s vegetarianism– the only flesh she would eat was fish–had attracted a lot of attention during the contest. In those days such fussiness about diet was not as common as it is today. She had always loved to draw and paint and back in Jamaica Cindy was approached by Donna Coore, the wife of Third World musician Cat Coore, to start a business called Ital Craft making jewellery from shells and other natural objects. Ital Craft went on to become immensely successful; at its height the hand-made jewellery found its way into stores like Bloomingdales, onto the runways of Paris and in sixteen locations in the Caribbean. Cindy disputes the claim that Marley had funded the start up with huge sums of money. “Not so much that I would ask but that he would think it was a wonderful idea because he was very supportive of any creative endeavour, any initiative and he just thought it was wonderful and he would come up there late at night when he was finished with studio work and whatever and pull up a stool and say ‘I’m a tradesman you know, what you need me to do for you now?’ and in fact one of our big driftwood tables – I had dug up a tree root from out of the sand out at Hellshire Beach — he leveled it and we put a glass on it. He loved to be involved in any little thing like that. And himself and another little youth from Hope Road leveled the top of that table for us and we put the glass on it. But he just loved the creative energy because he was so steeped in the creative process himself, he loved to see it in other people and since he was in a position to encourage it he would go to London and he gave a girflfriend of mine 500 pounds and said Now go and buy anything you can make jewellery with—beads, cords, bindings anything—I didn’t ask him, he just came back and presented me with this enormous duffel bag full of things and said ‘see a few little things here to make some things?’ Well girl, it was like xmas had come two hundred times over. Wonderful. He was very inspirational that way and when he went to Australia he bought a lot of shells for us and had them shipped. And he bought us like our first drill press to make tiny holes for the jewellery because we were using a dentist’s drill up until then. Loving these articles Annie. Gives new insight into the relationship. Amazing account of their relationship and how Bob was supportive of her creative endeavors and business. He was a man ahead of his time… may his soul Rest In Peace! Thank you for such an insightful article into the life of Cindy Breakspeare, a partner of Bob’s who I knew very little about. She is a phenom in her own right, as is Rita, too. I look forward to reading more of your articles about Jamaican life!